As I’ve mentioned before, transport ventilation shafts don’t have to be anything other than featureless boxes or cylinders. No member of the public ever visits them, so there’s no need for them to be anything other than perfectly functional. Except…except that almost inevitably they’re fairly visible objects in the built environment. While many recent shafts have been rather disappointing, so often architects have ensured that ventilation shafts have possessed their own sense of style and enhanced their environs. Be that the crenellated shafts of Kilsby Tunnel, or the art deco edifices of the Queensway Tunnel in Birkenhead and Liverpool, architects have often decided that if you can’t hide it, you should probably celebrate it. Good on them. That was the case in the early1960s when the-then Greater London Council (GLC) bit the bullet on overcrowding problems in the Blackwall Tunnel in east London, which linked Blackwall on the north side of the Thames with the Greenwich Peninsula on the south. At the time the tunnel was a single-bore structure containing a two-way road of two lanes, opened in 1897. The congestion wasn’t helped by the fact that the tunnel has tight curves at both ends, apparently to prevent horses bolting on seeing daylight at the end of the tunnel (I still haven’t absolutely confirmed whether this is an urban myth or not). The solution to the congestion, overcrowding, and regular traffic jams was a second bore, constructed slightly further east. This would become what is now the southbound tunnel, with the old tunnel now the northbound. The new tunnel required two ventilation shafts, one on each side of the Thames. Pressed into service was the GLC’s architect. Fortunately for posterity, that architect happened to be a talented young chap in his early twenties called Terry Farrell (1938 -). Yes, that Terry Farrell. The one who subsequently designed such buildings as the MI6 building in Vauxhall, The Deep aquarium in Hull, and several quite remarkable railway stations in China, including Beijing South and Guangzhou. Listed in 2000 at Grade II by English Heritage for their architectural importance, these shapely and unusual structures are of gunite (sprayed concrete; I sound so expert but I should hastily add that I only found this out by reading the listing record) and are unlike anything else Farrell has designed since. 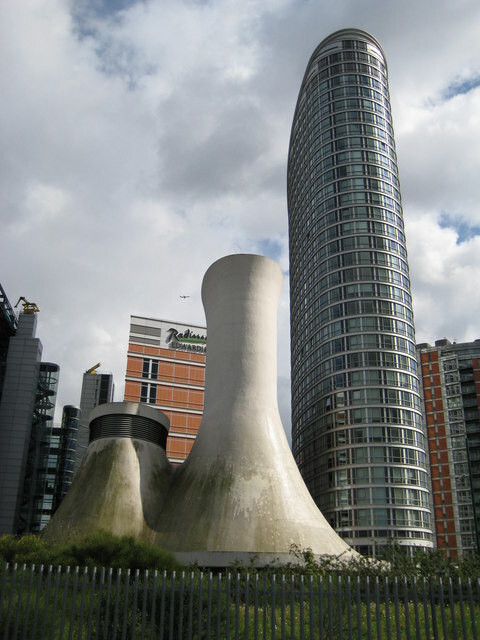 As English Heritage puts it: “Farrell compares the romantic structure of these very industrial buildings with the rugged machine aesthetic subsequently adopted for housing and office buildings in the Poplar area, and the curved forms of the two ventilation towers makes a strong contrast with the nearby Reuter’s Building and Robin Hood Gardens. They remain unique in Farrell’s built oeuvre, which was subsequently to be more inspired by contemporary American architecture.” Couldn’t have said it better myself. So I haven’t. But it’s about time someone gave them a good clean. Come on, this is an early work by a world-class architect. Let’s have a bit of pride, can’t we? Although both ventilation shafts remain, only the northern one (above) is easily visible – the Docklands Light Railway provides a very convenient viewpoint. 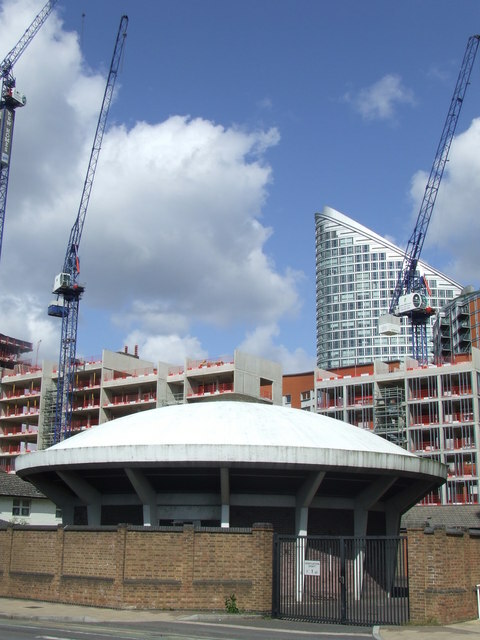 The southern one, meanwhile, is largely hidden because Richard Rogers’ Millennium Dome (now the 02 Arena) was built around it, concealing it from view. They don’t play nicely, these superstar architects. Ventilation shaft for the northbound Blackwall Tunnel. I love them. What brilliant little bits of industrial design. In 2010-11, the ventilation equipment on the northbound tunnel shafts was updated, and there was a need for faster smoke extraction in the event of a fire in the tunnel. While the existing vents in the eaves could handle regular ventilation, rapid smoke extraction required a larger outlet. Engineers Mott MacDonald came up with the solution of installing automatic hatches. To do this, the existing concrete roofs would be replaced with new ones incorporating the hatches, but retaining their original shape, as is fully explained in the supporting planning application. While BAM Nutall won the contract for the wider refurbishment of the northbound Blackwall Tunnel, of which the ventilation equipment replacement was a part, specialist smoke control company Advanced Smoke Group undertook the actual design, manufacturing and installation of the automatic hatches (see its fascinating page on the project, here). The work they did was brilliant. Sensitively retaining the silhouette of the original structures, a segmented steel-framed ventilator hatch has been built into the domed roofs. The hatch opens like a water lily in the event of an emergency, in just 60 seconds, allowing smoke to be extracted. They’re the largest automatic ventilators in Britain, at 8.5m in diameter. The solution is totally functional, but the unfurling of the flower-like hatch, a petal at a time, is a sublime piece of abstract kinetic art hidden in plain sight in the UK’s biggest city. You’d pay to see this as an installation in a modern art museum, and spend a long time musing on the relationship between the natural and the artificial, as a giant piece of machinery replicates a flower’s response to daylight. This video explains it all, and very impressive it is too.